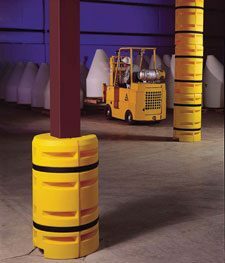 An incredibly tough column protector that absorbs impacts before returning to its original form and protecting your investments; your facility, equipment and your people. Simple one person installation and removal (no tools required) with self-gripping straps. Comes in highly visible safety yellow, U.V. stabilised for indoor and outdoor use. Suitable for various square, round or ‘H’ pattern columns.